Fountain Valley Restaurant Week- Now Thru Saturday 10/13! 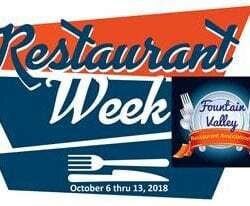 Yes, going on now through this Saturday, October 13th is Restaurant Week in Fountain Valley. Not all, but many restaurants are participating and featuring special dining menus. This is a great chance to try new restaurants! What fun! Come give them a try.